Though ever vigilant, the threat of the Mutant Lizards was getting to be too much for Shadow, Digger, Viper, and Specs. Will the new rookie Chunk, with his experimental new Dino-fighting machine, the Magma Tanker, be enough to turn the tides of battle..? Wow, that is great, especially the color scheme. Wow, this is cool! The color scheme is very appealing! Could we have more pictures, por favor? This here is a very good model mr sir. You might be interested in purchasing a bohrok. You might enjoy the s p l e n d o r of a nuvohk. It's really cool, I want to see more of these. The feet are so interesting! I was wondering what this message was all about. It just occurred to me that it was probably an April fool's thing. Well played. Thank you! I've been trying my hand at more system moccing recently, so it's not completely out of the question. Definitely check out Chubbybots if you haven't already for more incredible mecha. In the official Dino Attack sets, the lime green wasn't really a major part of the color scheme. It was generally limited to just the weapons, so I was trying to emulate that with the transparent green, which is why there's so little of it. 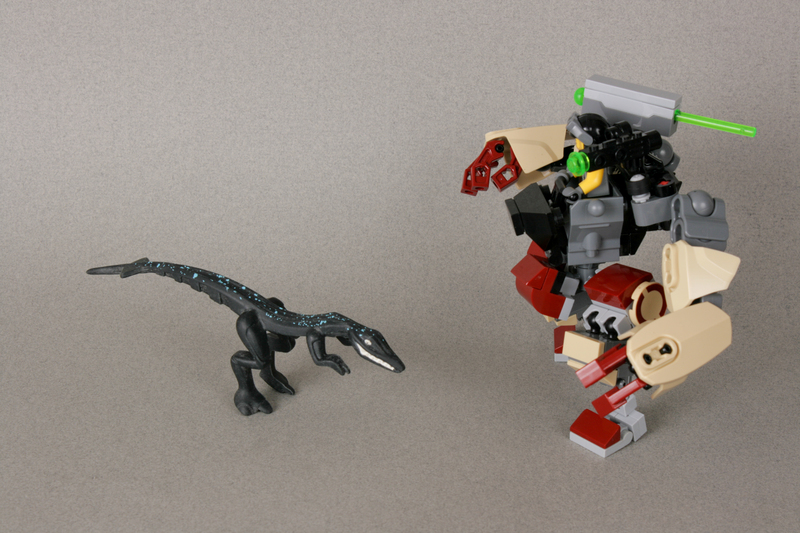 I'd love to see more Dino Attack MOCs from you... It's definitely not something you see MOCs of very often. Indeed. These messages on that day might forever lack context.